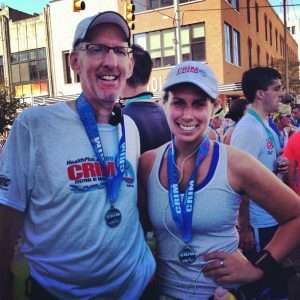 Running the Crim – Because She Can! At the age of 24, Anne Maxwell heard the words that no young person expects and all of us dread--you have cancer. Anne had been having pain in her right leg for months. Steroid shots didn't work. Finally, a scan was revealed that Anne had a tumor on the L3 nerve, which runs all of the way down the leg. But doctors told her it was benign. However, the pain got progressively worse and Anne ended up in a wheelchair and couldn't lift her leg off the ground. Finally, at the insistence of her father, Paul Maxwell, doctors at MD Anderson Cancer Center in Houston did surgery. That was when they discovered that she had Ewing's Sarcoma, a rare juvenile cancer that only about 250 people each year get. At that point, Anne was just beginning her ordeal. Anne had been living in Austin, TX, and when the diagnosis was finally made, she decided to return home to Michigan and move back in with her dad and mom. Because the tumor was inoperable, Anne began an intense regimen of chemotherapy and radiation at The University of Michigan Cancer Center. "I was getting the highest level of chemo you could possibly withstand," said Anne. And her battle became the family's battle. Her brother and sister-in-law packed up her apartment in Texas and brought all of her things home to Michigan, her mom went on Family Medical Leave and her dad worked from home to care for Anne. Nine months later, after 12 rounds of chemo, six weeks of radiation and extensive physical therapy--with her parents by her side--Anne was cancer free! "She's a real fighter," said Paul. Anne had run a few races in the past, but never long distances. So after finishing her treatments, she did a couple of things. "I bought a Louis Vuitton bag and headed off to Europe," she said with a smile. "And I joined the Crim training program. I wanted to accomplish something after going through such a terrible experience and I wanted to spend some time with my dad." Paul had been participating in the training program and Crim Festival of Races since 1995. "He loves it," said Anne. "I thought, 'I'm alive and capable of running this, so why not run 10 miles!'" In 2015, Anne joined group RT31. Although he was a faster runner, Paul switched to her group, whose pace was slower. "He's so much faster, but he will never leave me," said Anne. "At every race, we finish together." "It's been a great experience being with Anne and having her here," said Paul with a fond smile. Ironically, a good friend of Anne's was diagnosed with an osteosarcoma, a bone cancer. Fortunately, she too beat her disease. In 2013, Anne starting participating in the Stomp Out Sarcoma 5K Run and Walk at Hudson Mills in Dexter, MI, just outside of Ann Arbor. She was asked to chair the event in 2016 and has been organizing Stomp Out Sarcoma for the past three years. Anne serves as a spokesperson and motivator to get people to sign up for the race and help raise money for the University of Michigan Sarcoma Clinic. The money goes to research for a cure, as well as patient care. Her goal is to raise $50,000 and each year she gets closer. Last year, she raised $44,000. "It means so much to me to raise money and spread awareness," said Anne. Anne got married this year, just a week before the Crim (her husband also ran this year!). But she was sure to be back at the start line with her dad for the race. "I'm not the fastest," she said. "But I'm there because I'm still able to do it."